March 29, 2011, Henry Holt and Co.
One of the benefits of reading novels is to garner certain viewpoints of the characters, as some make statements about society or offer insight into something we hadn't really thought about for ourselves. Humanity is alive in this novel, Mothers and Daughters by Rae Meadows, as it traces the paths of three very different women who really aren't all that close on the outside. The bond of motherhood holds them together in a single trembling thread, as it seems communication was null and secrets were deep. The story of Violet was most compelling, as it seemed she underwent the most hardship. Violet and her mother left the farm and an abusive husband and struck out on their own in 1900. After scavenging around in Brooklyn, she was set on an orphan train at age 11, by her not very responsible mom. Violet matures very quickly and although we pity her, we know she will survive, because a third of the story encompasses her daughter, Iris. Iris is strong, capable, and willful. She was once married to a man she didn't feel passionate about. And now she is dying. Enter stage right, Samantha, who as a new mother is trying to decipher the legacy of these women and how they relate to her and what she should become. A tangled weave unravels slowly throughout the story as we flit back and forth in the narration between the three women. It is almost like a statement on how the roles of women have changed, and their expectations of life, or those forced on those from society. There is a mixture of emotions and themes as well as some cynicism that tried to overshadow the value of hope. While the reader is enthralled with the history of early America regarding the life of Violet, such as the mercy trains of the Children's Aid Society transporting unwanted children, Samantha is the contemporary woman who struggles within the confines of motherhood as she attempts to balance it with being a wife and an artist. Samantha seems bitter with her husband, Jack, for no particular reason. She also seems to want a lot of her life without actually doing anything to attain it. Yet, the fact that she is a new mother can make the reader empathetic towards her character as we remember what it was like with round the clock feedings of an infant. Otherwise, Samantha doesn't come off as being very likable. And the weird momentary stalking of a prostitute really sets you on edge and makes you wonder if Samantha is a fruitcake. The story is crafted in such a way that the element of time shifts continually as we go in and out of each memory, each thought, and each separate narration. Since this is a novel purported to explore the characters of these women, these shifts are not jarring in any way. The writing flowed, the story flowed, and I felt like I was putting together a puzzle of each of these women piece by piece. The supporting characters were each unique in their own way, from eccentric neighbors, cheating husbands to boring brothers. It is not epic saga material, but intriguing and insightful reading that kept me interested throughout as it effortlessly blends past, present, and even a bit of future with Samantha's little infant, Ella. I give it four of five stars because I didn't feel a strong conclusion to the family dynamic. There still seemed to be a lot more to be told, and if this was expanded upon, perhaps it would have been saga material. Since history is always my favored subject, I was very intrigued by the Children's Aid Society and the mercy trains that sent children like Violet across country to work on family farms, become adopted, or be indentured. Violet worked at a hospital and later married. After such meager beginnings, this otherwise boring life was welcomed. Thinking in genealogical terms, it is staggering to think of the 120,000 children who became displaced from their real families in the early 1900's, who had their pasts erased and were even given new birth dates. Another historical tidbit I gleaned from the story was a mention of the Hoboken, N.J. Steamship fire that occurred in 1900. I wrote a little post about it here. 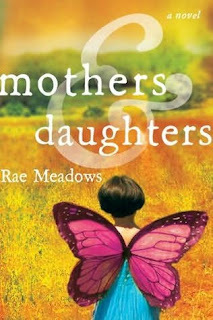 To wrap it up, Mothers and Daughters by Rae Meadows was an intriguing novel of the generational gaps between women, and a great story for new mothers. Since it also dealt with the death of Samantha's mother Iris, there was a bit of grief involved and the inhumanity of the suffering through cancer till one's last breath. Iris really couldn't wait to take that last breath, unfortunately Samantha realized too late there were things she would have liked to ask her mom. Mothers and Daughters was a sad, yet hopeful journey of these three women, and yet it was still much more of a portrait of relationships as a whole. I recommend this for both its tenderness with the age-old topic of motherhood and for its uniquely powerful storytelling that draws you into its spell.